The notion of place is important to many artists. Significant places become a stimulus for their creativity and a means of focusing their attention on parts of the environment they form special bonds with. 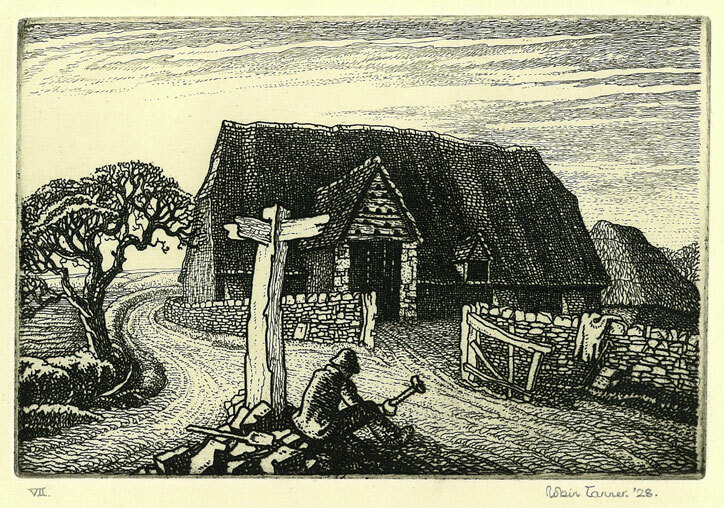 In the work of Robin Tanner who was born in Bristol in 1904, the area of North West Wiltshire became a place of personal significance and reflection. 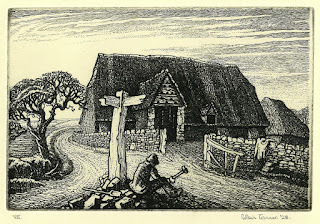 From as early as 1927 many of his etchings are based on an idealistic unspoiled view of the Wiltshire landscape. Since their marriage in 1931 Robin and his wife Heather lived at Old Chapel Field in the village of Kington Langley, Wiltshire. In 1924 while Robin Tanner taught at Blackheath Road Boys School in Greenwich by day, he became an evening student at Goldsmiths College London under the instruction of Stanley Anderson. While at Goldsmiths he became friends with many of the day students including Paul Drury took Tanner under his wing. 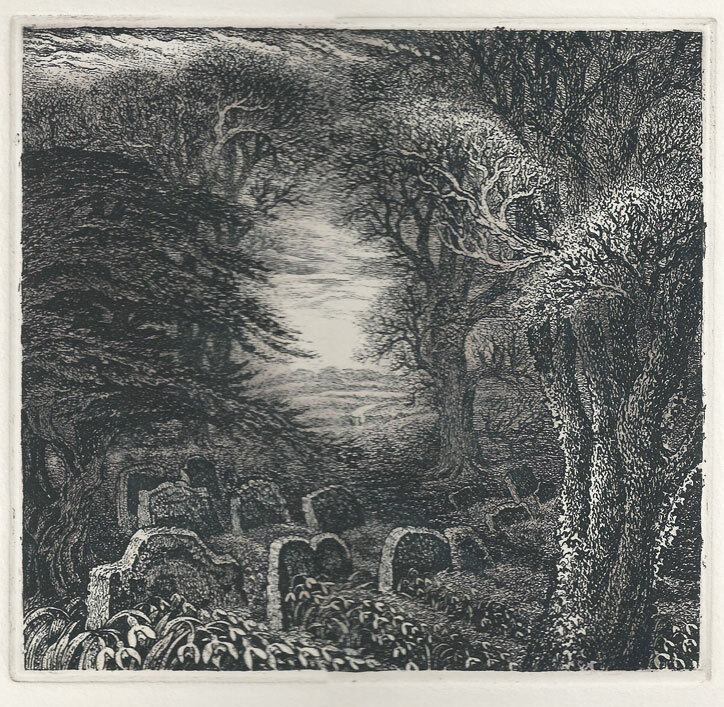 He invited him home to Lancaster Lodge to meet his father, the artist, Alfred Drury and was instrumental in introducing him to a number of other artists and print dealers such as David Strang and John Nicholson. In 1928 Tanner became a full time student at Goldsmiths. In that same year he also bought the Old Chapel Field property at Wiltshire. The first two etchings included, “The Road Maker” and “The Hedger”1928 were among Tanners earliest and were intended to be part of a series on the theme of country labours. 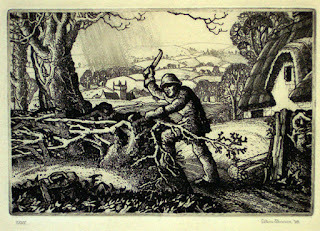 The “Woodman” was the only other etching in the series to be completed. Both etchings show the influence of the Goldsmiths students as well as of Palmer and Griggs but in particular of Griggs. Tanner met Griggs on varnishing day at the Royal academy in 1929. In many of Tanners later etchings like” Gray’s Elegy” 1980, illustrated (from the memorial portfolio), a combination of natural and rustic man made forms frame the view into a distant often moonlit field of hedgerows, villages and forests. Joy and I love these prints by Tanner.Thanks, Ron!